A while ago I wrote about some new players in the home router space. Since then I pre-ordered my Luma 3-pack and have been anxiously awaiting delivery. The app itself is pretty straightforward and easy to follow. You don't need to be technically inclined, and it will configure all the Luma units you own one at a time in a methodical manner. What is unique to Luma is it asks you what kind of residence you have (Apartment/condo, townhouse/semi, or detached house) as well as how many floors your residence has. Luma asks you to position where your modem is on a map it provides to understand where the first Luma device is. From there it will recommend locations for the other units to provide the best coverage for your home using a mesh network. (Mesh means the other Luma units don't need to be wired to your internet connection, although they can be). The Luma's connect to each other wirelessly, without sacrificing speed as you would typically see with a range extender. Luma does a good job in suggesting locations, however in my case I had other considerations that made me adjust slightly. First off, I couldn't put one of the units in my 5yr old's room if I wanted it to survive, so it went to a different spot on the 2nd floor. I don't do much that requires connectivity from my basement (yet) so instead I decided to put a 2nd Luma on the main floor as that's where the majority of our heavy lifting over WiFi happens. Even with the Luma's distributed this way the basement coverage is as good or better than I had with my old router. The Luma does a speed test periodically and updates the results in the app so you can see what sort of connectivity it is getting from your ISP. As with any speed test when it leaves your ISP's network to reach a test server (and many do) the results might display slightly slower speeds than you were expecting. I'm pretty pleased with the speed I'm getting, and I have run tests on individual devices where I've reached almost 300MB download. As promised by Luma I was able to create profiles for my kids and then assign their devices to those profiles. Once that was done I just adjusted the category of websites they were supposed to have using the easy slider scale, and Luma kicked those restrictions in to effect almost immediately. So where does Luma fall down, and where is it missing features offered in an Eero? Let's see. Not all features promised on the website actually work at this point. Luma's site promises that you can approve or reject devices from joining your internal WiFi with a quick swipe. This sounded like a fantastic feature but I couldn't find it in the app. When I asked support they indicated it is roadmapped but they don't have a release date yet. Luma's website also promises you can see what websites people are going to (presumably your kids) and either approve or deny requests for sites that fall out of the category set for their profile(s). When I asked support where I could access these settings I was again told it was roadmapped but no release date was set. It's misleading to market the product as having these features when they aren't live yet. Hopefully they get released soon. 1) You cannot change the IP range. Luma uses an address set at 192.168.55.0 and there is no ability to change this. (Yet) This was an annoyance as I have a few devices like my NAS using static IP's so they had to be manually changed. 2) You cannot program DNS servers. The Luma takes whatever DNS servers your ISP provides from the modem, it will not let you set your own. This is a problem if you are using a smart DNS service like Getflix to access geo-restricted content, it means the service can't work. 3) Luma doesn't play nicely with other routers. To work around the DNS issue I tried putting my old router in front of the Luma and having it set the DNS. While this let me use Getflix, my speed dropped dramatically, falling to about 45MB from the 250MB I should have been getting. Eventually the Luma units started going offline. When I called support they indicated Luma's don't react well to other routers in front of them. After removing the router all the Luma's began functioning normally. 4) You cannot assign devices "friendly" names. (Yet) I emailed support to ask how I could set easier to recognize names for the devices on the network (Makes it easier for me to administrate rules) and was told again that this was a roadmapped feature but not available just yet. 5) No bridge mode. Unlike the Eero there is no option to put the Luma in to bridge mode. Bridge mode basically turns the Luma in to a wifi system but you would still need a router. I understand why Luma doesn't support this (yet), they are differentiating themselves from other solutions with their enhanced security and a bridge mode would negate most of that. Still, the owners should have the option of using bridge mode if they choose. I suspect Luma will add this function soon, along with a big pop-up security warning. 1) Set up: Luma's app is well thought out for walking the average person through set-up. The instructions use plain language and are easy to follow. Pretty much anyone can set up a Luma 3-pack in under 10 minutes. 2) Speed: Luma can handle up to 1GB internet connections, and the WiFi you get out of them is FAST. Your laptops, tablets, etc should be humming along once connected to Luma. My Amazon FireTV used to get between 6MB-9MB connecting to Netflix. Now it's pretty steady between 85MB-90MB. That's a huge improvement, and it makes streaming 1080p content a snap, no buffering at all. 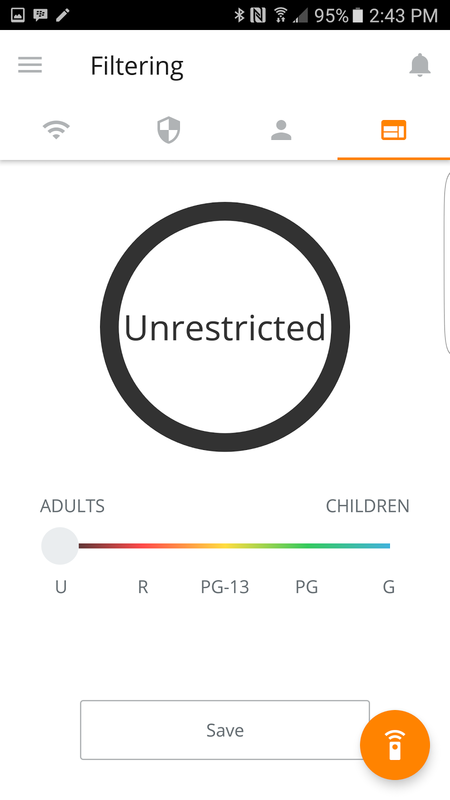 3) Parental Controls: The sliding scale follows rating categories like movies, making it easy to understand and simple to apply. If you want to completely "pause" the internet during meal times etc it's as simple as pressing one button in the app. 4) Guest WiFi: Turning on the guest WiFi is a one time switch-on where you also set the password. Getting your friends on to your guest WiFi is a snap, the Luma app has a button to invite people to your guest WiFi and will send them the SSID (The WiFi name) and password via email, text, etc. Very convenient. 5) Security: Luma watches all the devices on your network and makes sure they aren't phoning home to botnets or other malware command & control servers. If it sees activity like that it intercepts the traffic & blocks it. You get an alert in the app (and presumably via email although I haven't tried yet) letting you know there is a security concern with a device, and the relevant information about the device etc. 6) Port forwarding: Luma will let you set up port forwarding to the internet. This is useful for more technically-inclined users who are running servers or VPN's at home and want to be able to access them from the internet. 7) Stability: The WiFi provided by this product just works. Since setting it up (without a 2nd router in front of it) I've had no problems with any of my devices accessing the WiFi whatsoever. I was worried that I'd begin getting complaints from my family about problems but there have been none, it's been completely reliable. 8) Support: This is usually a sore spot but I have to say I have been really impressed with Luma's support. If you send an email it gets a response quickly, and when I called in I reached a person surprisingly fast. The support staff are pleasant and helpful. Luma's got support done right, which is so important. Support is like car insurance, you never think about it until you need it, but when you need it you really need it. 9) Newer Technology: Luma uses MU-MIMO (Sometimes called next-generation AC or AC wave 2), meaning it can talk to all WiFi devices at once. The older standard (Used by Eero and many other manufacturers) is SU-MIMO, which means the WiFi access point has to finish talking to one WiFi device before it starts talking to the next. As you begin to buy new devices they will likely have MU-MIMO baked in to their WiFi cards, making them even faster on a Luma network vs an Eero network. For more on the differences between SU-MIMO and MU-MIMO click here. Like all products in this space Luma will continue to enhance and add features via software updates. This is a great approach because you're not stuck with the functionality as it was at the time of purchase. It also means there's no need to try and perform manual firmware updates which almost no one ever does, resulting in security issues down the road. I have no doubt Luma will address the shortcomings mentioned earlier, and I'm hoping it happens soon because once done this will be a killer system. In my case I wish I had a 4th Luma unit to put in the basement, but that's hardly Luma's fault. For the average home user who just wants fast, reliable WiFi throughout the home Luma is a great option. At $399 it's $100 cheaper than the Eero which makes it pretty attractive. I'll post a side-by-side comparison on Luma vs Eero soon, but I'd have no hesitation recommending Luma to my friends for a fast and easy solution. Got a specific question about Luma or Eero? Post it in the comments section and I'll do my best to answer it. Thanks for the note. I'm aware the system sends information back to Luma, that is kind of the point for the "managed security" aspect of the system. That said there is no indication that the data is used for anything other than analytics and device protection. I could sit there with a copy of Wireshark and really see what was being sent up/down, but I'm just not that concerned to be honest. The difference between Luma having access to the data and gmail having access to my more confidential emails isn't the same. Google actively sells the data or byproduct of the data to allow for targeted advertising. If someone really wants their data to not be phoning home somewhere they should probably employ a TOR router, but the overall web experience is going to take a significant hit. I just kicked Luma out of my house! I dealt with a problem that they were unable to resolve for five months! 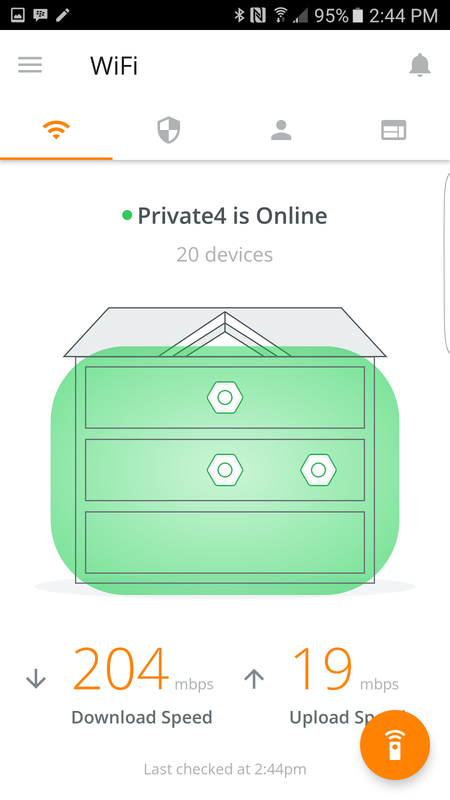 I had four Luma nodes in my house and their ability to provide proper hand-off of clients between AP's is broke!